Yesterday, Prime Minister hailed his demonetisation move, saying it is aimed at curbing corruption and black money. BENGALURU: Rejecting Prime Minister Narendra Modi’s allegations that opposition parties were trying to defend the dishonest and were running away from a debate as “absolutely wrong”, Congress leader Mallikarjun Kharge on Tuesday said the former was not ready to address Parliament because he did not have guts to participate in the debate. “This is absolutely wrong. Modiji himself failed to address parliament. Modiji speaks outside and not in parliament because there was pandemonium. If in the din, the Taxation Bill could be passed, the Disability Bill and supplementary demand were passed, then why did not Modiji make a statement? 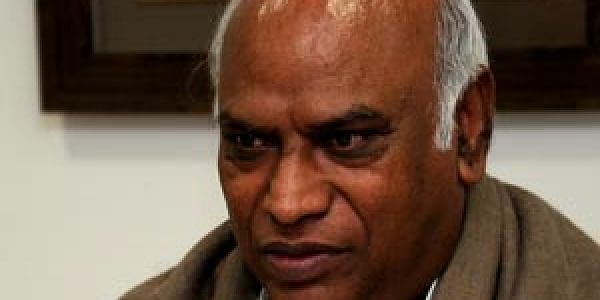 He was not ready because he did not have guts to participate in the debate,” Kharge told ANI. “When Modiji declared demonetisation on November 8, he should have given a statement in the House on November 16, but he did not. When he made the announcement outside parliament and made statements on TV, radio and for press, then why did not he give a statement in the House,” he asked, adding that the Prime Minister came to the House not for answering questions, but just to mark his presence. “He thinks he can speak anything outside parliament because those are electoral stunts as he had said he would bring black money stashed in foreign nations and would give Rs. 15 lakh (to everybody), but later BJP president Amit Shah said those were political stunts. So, these stunts are their preparations for the election in Uttar Pradesh, Punjab, Goa and other states and that was why they did not want a discussion in the House,” Kharge added. Addressing his sixth ‘Parivartan Rally’ in Kanpur yesterday, the Prime Minister hailed his demonetisation move, saying it is aimed at curbing corruption and black money and to benefit the poor and honest citizens. Prime Minister Modi attacked the opposition for stalling proceedings during the winter session of parliament, alleging that parliament was not allowed to function as opposition parties were trying to defend the dishonest and were running away from a debate on the issue of corruption and black money. The Prime Minister said that during an all-party meeting convened before the winter session, he had suggested a debate on simultaneous elections to the Lok Sabha and state assemblies and donations to political parties.